The faucets we will be considering in this article are equipped with a pullout/pulldown hose that provides flexible water delivery to whatever you are cleaning and that simply retracts to its original position once the job is done. ​As such, these faucets add much desired convenience and ease to the job of cleaning pots and pans and the various parts of the sink. If you are looking for a pullout faucet, you might have a problem deciding which to get as there are so many brands and types available. 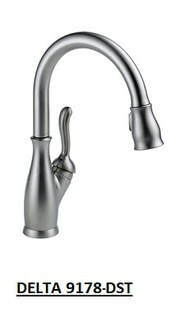 To simplify the selection task, we will be presenting in this article two of the most popular and best rated pullout faucets: The Delta Leland 9178-DST and the Moen Arbor 7594. These are both cartridge type single-handle faucets: in a single-handle faucet, the turning of the handle makes the internal cartridge to rise or lower within the faucet body in order to start and stop the flow of water. Both hot and cold water flow through the same cartridge. A simple turn of the handle controls the mixing of the hot and cold water and therefore the temperature level. 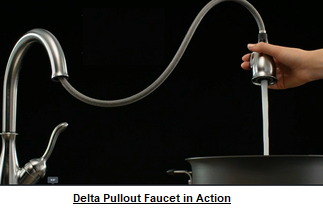 This article will present the Delta 9178-DST and Moen Arbor 7594 pullout/pulldown faucets. These were not just the most popular in their category among Amazon customers at the time this article was written, but they had also received excellent reviews from most Amazon buyers (an average rating of at least 4.5 stars each out of 5 stars!). 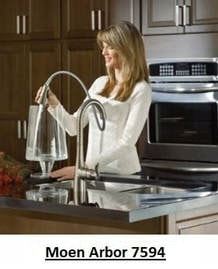 Cartridge type single-handle faucet with Diamond Seal® valve technology. The valve features a diamond-embedded ceramic disc, thanks to which no lubrication is required and seal wear is practically eliminated, resulting in a lifetime of reliable performance. In addition, this technology makes installation of this faucet quite easy. MagnaTite® Docking: The faucet is equipped with a powerful integrated magnet that snaps the faucet spray wand precisely into place and holds it there so it stays docked when not in use and doesn’t droop over time. Touch-Clean® Spray Holes: Soft, rubber holes allow you to easily wipe away calcium and lime build-up with the touch of a finger for an instantly refreshed look. Installable to 1 or 3-hole sinks. Easy to Install with Duramount mounting system. Everything you need for the installation comes together in one convenient box, including integrated 3/8" supply lines that all but eliminate leaks, and Quick Snap® connect hoses. Optional escutcheon included for use with additional mounting configurations and a cohesive look. Two-function spray wand allows you to easily and ergonomically switch from spray to aerated stream. High-arc pull-down swivels 360 degrees. Total hose Length 54". The hose automatically returns to its original position, docking smoothly and securely. Lifetime limited warranty on parts and finishes. 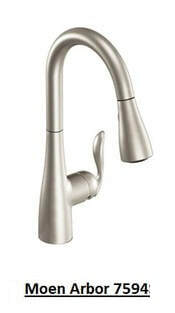 Cartridge type single-handle faucet with Moen's 1255™ Duralast™ cartridge. Installable to 1 or 3-hole sinks. A deck plate is included. Easy to Install with the proprietary Duralock™ quick connect system which allows water lines to be securely connected in just one quick step. Two types of spray: Aerated stream for everyday cleaning and Power Clean™ spray for heavy-duty cleaning. There is also a pause function that lets you conveniently stop water flow from the spray head. Equipped with the proprietary Reflex™ system for smooth operation, easy movement and secure docking of the pulldown/pullout spray head. ​Faucet pullout/pulldown hose offers flexible water delivery and hose retracts with ease. Lever type handle makes it easy to adjust the water. Temperature controlled by 100˚ arc of handle travel. 360˚ rotating high arc spout provides height and reach to fill or clean large pots while pullout wand provides the maneuverability for cleaning or rinsing. Total hose Length 68". The hose automatically returns to its original position, docking smoothly and securely. Flow rate is 1.5 gpm (5.7 L/min) at 60 psi. Flexible supply lines with 3/8" compression fittings. Lifetime limited warranty against leaks, drips and finish defects to the original homeowner. So which of these two faucets to get? Clearly, we are dealing here with two very high-quality pullout/pulldown faucets that were designed to allow execution of messy kitchen tasks conveniently and efficiently. Note that both faucets come with all the essential features pullout/pulldown faucets should have. If properly installed, you will observe that their valve works smoothly, their hose extends and retracts as they should, their sprayer works properly and their finish is flawless. And you will see no leakage. Moen Arbor 7594 comes with a pause button on the nozzle which you may find handy when the nozzle is in the pullout position. It will allow you to execute properly your tasks by turning off the water as needed, in particular when you are cleaning the sink and washing pots, since you don't want to wet the kitchen counters. 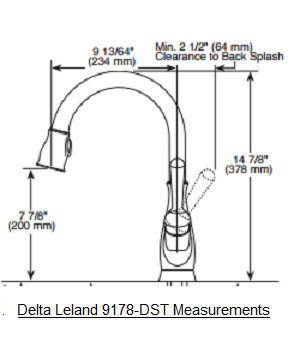 ​The total hose length of Moen Arbor 7594 is slightly longer than the total Delta 9178-DST hose length. Therefore, the Moen faucet has a slightly larger swing radius. Delta 9178-DST comes in arctic stainless, chromespotshield stainless or Venetian bronze. Moen Arbor 7594 comes in matte black, chrome, bronze or spot resistant stainless. Both these faucets are designed so that the cartridge insert is easily replaced, in case the faucet begins to drip or leak. And with the limited lifetime guaranty and excellent customer service these faucets come with, replacing the cartridge, if ever needed, should be a breeze. Note again that, at the time this article was written, Amazon users had provided raving reviews for both faucets and given an average rating of 4.5 stars out of 5 stars to each. So, you will not go wrong by getting either of these two faucets! Please click the faucet of your choice below for price information or to purchase. Amazon often provides a good discount on the List Price of sold products. If a discount is available, the List Price and the actual Amazon price will be shown when you click the images below. Would you rather be interested in a touchless/motion-sensing faucet? Doing daily kitchen tasks such as cutting meat often leaves your hands quite dirty and full of bacteria which you may easily transfer to your faucet when you use it to wash your hands, foods, pots, etc. Also, often your hands are just too full to even be able to access the faucet. Motion sensing faucets were designed to make your time in the kitchen more efficient and safer from a sanitary point of view. 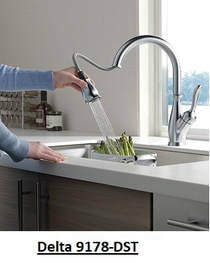 These faucets free your hands by activating water flow based on simple hand movements so that you can accomplish your kitchen tasks with greater speed and efficiency without having to touch the faucet handle and without having to worry about spreading the germs and bacteria to others. They mostly run on AC current, but some battery run models also exist. For a comparison of the best touchless faucets, please click: Comparing Three of the Best Touchless Faucets.